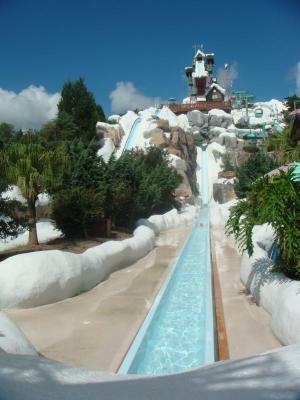 Typhoon Lagoon Water Park is one of two water parks located on Walt Disney World Resort property in Kissimmee, Florida. Visitors to the park are in for a lot of wet fun since this 56-acre water park offers numerous attractions, rides and amenities. Typhoon Lagoon was the largest water park on the grounds of the Disney World resort until Blizzard Beach opened. Though it is not the largest resort-based park these days, it is still a popular spot that is packed with water-based attractions. The park warms the water to a pleasant 70 to 80 degrees year round, providing visitors with a fun way to cool off in the hot summer months. There are numerous water attractions at this park, with something for just about everyone. If you like being outdoors, playing in the water, or relaxing beside the water, you're sure to find plenty to do at this fun destination. Castaway Creek: Castaway Creek One is one of the main features of the park and is appropriate for visitors of all ages. This "creek" spans some 2100 feet. 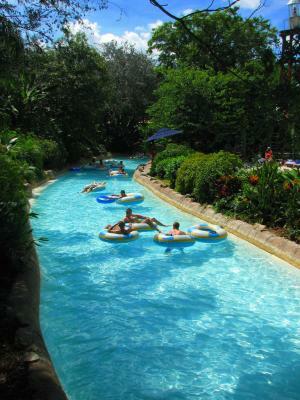 It is a river raft ride that allows guests to move lazily through tubes and tunnels. It features caves, open grottos, rain forests, waterfalls and a waterworks area. Ketchakiddee Creek: The Ketchakiddee Creek is designed just for children. The attraction is open to kids who are under 48" tall and features ten activity areas with water slides designed just for little kids and other child-friendly water features. Surf Pool: Surf Pool is a large wave pool that is mild enough for most, alternating between six-foot waves and gentle surf. The Ketchakiddee Creek is a great place for the toddler and up crowd. This play area offers water attractions as well as sand to play in. Parents do need to accompany their children here. Sandy White Beach: If you're looking for a spot to chill out and relax, Sandy White Beach is it. Stretch out in a hammock or lounge chair and shield yourself from the sun under an umbrella while enjoying lovely views of the water. Crush N Gusher: The Crush-N-Gusher is a popular attraction for guests 48" tall and up that represents an abandoned tropical fruit-processing center. This thrill ride offers a one-of-a-kind experience. Groups of two riders enter a raft and select one of three large roller-coaster slides. The slides are between 410 and 420 feet in length. The slides feature twists, spillways and tunnels that eventually lead to a plunge into the park's large water area, Hideaway Bay. An interesting fact about Crush-N-Gusher is that just one of these slides contains enough water to fill a standard home pool in just one minute. Storm Slides: This attraction features three fast-paced body slides designed for grown-ups, teenagers and big kids to enjoy. Those who enjoy thrill rides will delight in body-sliding down these three story slides at a rapid pace. Gangplank Falls: This rapids-style ride allows guests to ride a 300-foot long water slide on a large, 4-seater inner tube. There are many fun water effects throughout the ride. The rapids can be rough, so this ride is limited to guests 48" tall and up. Mayday Falls: Mayday Falls is the park's longest waterslide. Guests will travel through waterfalls and caves. Riders have their own inner tube and travel down the mountain right under the Miss Tilly shrimp boat poised on top of the mountain. This ride is also limited to visitors 48" high and taller. Keelhaul Falls: This falls attraction is the mildest of the three falls rides at the park. Big kids, teens and adults enjoy rushing down the mountain on an inner tube through a waterfall and a cave tunnel. Humunga Kowabunga: This ride features three enclosed side-by-side slides that provide guests the thrill of traveling down five full stories in just a few seconds, reaching speeds of up to 30 miles per hour. The ride is for guests 48" in height and taller. Shark Reef: A place not to miss is Shark Reef. Adults, teenagers and big kids who want to swim with the fish can enjoy saltwater snorkeling with live sharks, tropical fish and stingrays. Visitors can enter this observation area both above water and underneath. Surf Lessons: Guests eight years and up can also learn how to surf by attending lessons scheduled during the hours before the park officially opens, or by setting up private lessons. Purchasing single-day passes to Typhoon Lagoon is a good option if you plan only to visit the water park during your time at the Walt Disney World Resort. If, however, you plan to visit other parks in addition to Typhoon Lagoon, you may find it best to choose Magic Your Way tickets with the Water Park Fun & More Option. Single Day: As of July of 2017, single-day admission to Typhoon Lagoon for visitors ten and older is $62 and $56 for visitors ages three through nine. There is no cost for children under three. Magic Your Way with Water Parks: Total fees vary based on the number of days you are purchasing passes for and any other resort add-ons that you select. You can add water park visits to base Magic Your Way passes for an additional $22 per day, as of November 2012. Visit the official Walt Disney World ticket store for details. Fees are subject to change. See the links above for current rates. There are dressing rooms, lockers and showers available throughout the park. Lockers are for rent for a small fee. Life jackets are available without charge, but you do have to leave identification as a deposit on them. Life jackets brought into the park must be lifeguard approved. 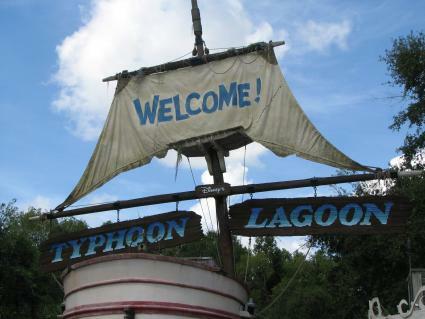 There are two picnic areas located in Typhoon Lagoon. No alcoholic beverages or glass containers may be brought into the park. Several food areas are scattered throughout the park. Leaning Palms is an eatery serving hamburgers and hotdogs. Typhoon Tilly's serves a number of foods including ice cream. If you'd like to enjoy a private retreat, consider renting a Beachcomber Shack that includes refillable drink mugs, a cooler filled with ice and bottled water, a private locker and towel service for up to six individuals. If you're looking to truly make the most of your next trip to the Disney World Resort, consider setting aside some time to splash around and have some wet and wild fun at Typhoon Lagoon. You'll likely find that including water park fun in your Disney vacation only serves to enhance the experience for everyone in your group!